Earls Court is really the 'centre' of the District Line - it's even been referred to as the Crewe of the line! All of the line's trains go through here so it is the busiest station with four platforms used by the District Line - two eastbound and two westbound. At peak times a train is timetabled to go through each of the platforms about every three to five minutes. As mentioned elsewhere, it is also a train crew depot and one of the major crew changeover points. Earls Court is also home of the Line's administrative offices and the control room is also located here which signals the whole of the line west of Tower Hill (with a few exceptions). Additionally there are two platforms 'below ground' that are served by the Piccadilly Line. All photos in this section are by Phil Wimbush, unless otherwise credited. To assist in your orientation of the layout of the station, and the signals to which I refer, the following diagram will be of some assistance. Please click on the image itself if you wish to view the 'full size' version. I think you will have noticed if you've looked on the full size version of this diagram just how many signals and sets of points there are around the area, and this may help in understanding further some of the comments I've described below. Do bear in mind though that this is a signalling diagram - it's not a map of the area. Eastbound services are served by platforms 1 and 2. Services from West Kensington and Olympia can be routed into either platform but services from Wimbledon can only route to platform 2 - there is no crossover west of the station to allow passage to platform 1. This does have disadvantages as if there is a train remaining in platform 2 for whatever reason trains from Wimbledon cannot get into the station. There was a crossover in the past but it was removed; I suspect that it is now regretted that this was done and I wonder if when there are major track and signalling upgrades in the future consideration will be given to its reinstatement. This picture illustrates the Train Describer on platform 1 - that on platform 2 is identical. The 'black box' visible between the illumination lamps illuminates is used to indicate which train is to depart first and is used most frequently when trains in both platforms have the same destination. This is the station starting signal at platform 1. As set this indicates that the train is able to depart (the upper aspect), that the train's routed towards Gloucester Road (which would be correct for all but High Street Kensington or Edgware Road destinations) and that the next signal is also showing a proceed aspect. Should the driver have been given the wrong route he would contact the Line Controller. In this instance the route is after the next signal, as is indicated by the route indicator being above the repeater, and the Controller may instruct the driver to proceed to the next signal (EC7) where the signaller will take an emergency release on the incorrectly set route. This means that the next signal would go back to danger and it would be two minutes before the correct route can be set. More likely is that the Controller would tell the Train Operator to remain where he is until the route has been correctly set. You will note that as well as the signal head itself, there is a collection of other equipment and signs visible to the driver adjacent to the signal. I will give more detail of this later. Also associated to this signal (and visible about three quarters of the way down the platform, but not illustrated here) is a Draw Up signal. Later on this page is an example of such a signal, with an explanation of the purpose of such signals. This is the station starter at platform 2. The first thing to note is that it would not be possible for this signal to be set like this should the signal in the last photo be showing a proceed aspect! This signal is set so that the train in the platform (which is being initially routed towards High Street Kensington) so that it may proceed to signal EC7. You will note that there is no repeating signal; this is because the driver can already see signal EC7 - repeaters are used when the next signal is not visible at what is referred to as a 'sighting distance'. However, it would be possible for both this signal and that on platform 1 to be given 'proceed' aspects if this signal was cleared without the route indicator. This would enable both trains to move to the next signals (EC7 for the train on platform 1 and EC10 for this platform) and they would then be cleared appropriate to the routings for the trains involved. This is a complex area, so a driver must be alert to his surroundings and the routings he's given - if a wrong route is not noticed it can lead to a train going in the wrong direction! This not only gains the displeasure of the passengers, it also leads to an interview with a Duty Manager for the driver! One difference here is that should the train be going towards Gloucester Road, normally the driver would expect to see a green aspect, but without a route indicator. However, when he calls the Controller he can be instructed to accept the route as set and the signaller will correct the route at EC7, rather than taking a 'release' on this signal - this saves the built in time delay which would result. The term used is that you'll go 'round the houses'! Incidentally, the two signals above - EC6 and EC11 - are shortly to be resited. At the moment both are only accessible from fairly old and unstable structures, which means that access to and maintenance of them is difficult. As at the time of writing this update (19 June 2004) the work is in progress - once commissioned I'll get some new pictures of the relocated signal. Trains approaching Earls Court from Gloucester Road can be routed to either of the westbound platforms 3 and 4, but trains from High Street Kensington have to pass through platform 4. This is why when running to the timetable the High Street Kensington to Olympia service and C Stock trains operating the Edgware Road route will always pass through platform 4. As with platforms 1 and 2, the Train Describers on platforms are identical as trains from either platform can be routed to any of the possible westbound destinations. The only difference is that there is no 'first train' box installed on these platforms as (at least in theory) there should not be trains in both platforms for the same destination. In practice though, this does occur, particularly for services to Wimbledon and towards the end of traffic when many trains are heading towards Ealing Broadway before stabling overnight in Ealing Common Depot. This is the station starter at platform 4. As you can see it is showing a danger aspect. When cleared with a plain green aspect, trains are routed towards Wimbledon. If it clears with the route indicator illuminated this would indicate that trains are routed towards West Kensington, so that would be how a train for Ealing Broadway, Richmond or Olympia would expect to see it set. This is the station starter at platform 3. The signal is showing a proceed aspect and the train is routed towards Wimbledon. For a more detailed explanation of the various equipment visible adjacent to the signal please click on the photo above. I mentioned earlier that two of the signals at Earls Court have Draw Up signals associated to them. The photo above is the Draw Up signal associated to EC28 - the addition of the '0' as the last digit indicates this. Draw Up signals are used to protect 'short overlaps' - this really means that they are to prevent any possibility of two trains colliding, should one pass a signal at danger; they protect the 'main' signal. The way they work (as simply as possible) is as follows. Let us assume that the signaller has already cleared a train away from platform 4 to go towards West Kensington. Signal EC28 (for platform 3) will obviously remain at Danger. However the distance between EC28 and the train crossing the pointwork ahead of it is small, and should a train come down platform 3 at speed and fail to stop at EC28, although it would be 'tripped' there could still be a possibility of it over running so far that it would collide with the train proceeding correctly. Remember that a train travelling at 35 mph will still take a considerable distance to stop, even with the Emergency brake applied. So a Draw Up signal is set to 'test' the speed of an approaching train should its associated signal and the pointwork it protects be set in a certain way. It will remain at danger (and so its associated trainstop will be raised) until the speed of the approaching train be proved to be low enough that there is no possibility of a collision even if the train were to overrun the associated signal. The aspect at this time will change to yellow - it is warning that the main signal is at Danger. However, on approach, should the main signal change to green, the Draw Up signal will then, too, display a green aspect. There is one further feature on platform 3. It is possible to reverse a train back eastbound from this location. This tends to be done either in the case of a very late running train or where there are other problems west of Earls Court which probably means that the service is already seriously disrupted. It really is a 'last gasp' measure; it takes a while to clear the train and then the signaller will have to slot the train into the eastbound flow of traffic. More usually trains are sent to Parsons Green or, occasionally, Olympia. This is the 'wrong road' station starter at the east end of platform 3, signal EC16, looking towards Gloucester Road/High Street Kensington. As you can see from the photo it is very much tucked away from view, at least from the platform itself. To assist the Train Operator in reversing is a mirror (not visible here) which enables the Train Operator to carry out his platform duties. The signal plate is just visible, being attached to the wall in front of the signal. As a train approaches its position on the track is located quite precisely by the check rail. 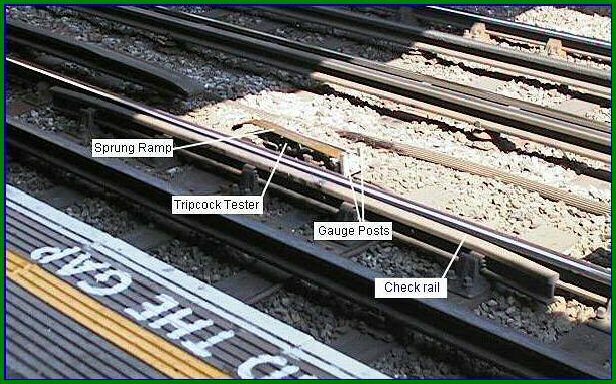 The tripcock arm passes through the gauge posts - if it is out of alignment then there is a good chance that the train will be tripped. The arm then presses down on the sprung ramp - this turns out the visual indication that can be seen by the Train Operator. If the lamp fails to extinguish, and the train has not been tripped, it has failed the test and must in most circumstances) be withdrawn from service. It can then only proceed with a second person in the cab, who will then act as the 'emergency brake' - he observes that the driver is correctly obeying signals. Earls Court is currently undergoing major refurbishment, including the installation of lifts which will allow 'step free' access to the District Line platforms. The following were taken by me on 1 June 2004, and show progress to date. This was taken from the high level walkway above platform 1 looking west towards the Warwick Road exit and shows the installation of the lifts (still partly encased in scaffolding and panelling) which will give access to all four platforms. This is taken from about the point where access to the lifts will be gained, looking east towards the Earls Court Road exit. The new staircases giving access to the platforms can be seen. Visible to the right of the stairway which goes to the westbound platforms is the new station control room; this is still in construction at present. Visible on the platforms are the new low level public address loudspeaker stands; call points are also being fitted for information and emergency use. The view from the area above platforms 1 and 2 looking west - the high level walkway is visible to the right of the picture, the new stair case to the left.